Often the first notification of a spill comes from a member of the public, hours and sometimes days after the actual incident. Such late notice can intensify public health and environmental impacts, and increase the cost of cleanup efforts. Following a sewer spill at an environmentally significant site at Midway Point in Tasmania in August 2017, the statewide water utility sought a way to reduce the likelihood and impact of future spill events. To do this, they needed a way to predict future sewage spills, with plenty of notice so preventive measures could be taken. The water system has 970 water and sewage pumping stations. A portion of these are high-risk sites where spills have occurred in the past. The system also has 176,000 sewer connections across the state, and suffers about 2,000 sewer mains breaks and spills per year. 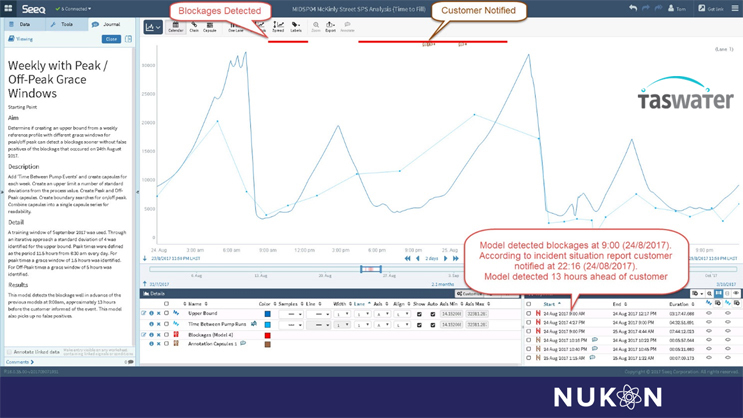 Having previously worked with the utility on its process historian data management system, Nukon was asked to identify and provide a proof-of-concept for an online sewer blockage detection system. Nukon (www.nukon.com.au) aims to be the preferred partner in unlocking data for decisions that matter. Based in Australia, Nukon helps companies deal with the complex world of IIoT, big data, historians, supply chain optimization, business and operational intelligence, manufacturing operation and execution systems, ERP program management, and other advanced software and systems. At the water utility, Nukon had been helping the company develop statistical analysis programs using Seeq software, an advanced analytics application. Using Seeq to analyze data from the process historian, Nukon developed and tested a model based on data from the Midway Point spill event in August 2017. The goal was to see if the model could detect the blockage faster than current methods. Seeq’s multiple applications enable users to rapidly investigate and share insights from data stored in enterprise data historians — such as OSIsoft PI, Honeywell PHD, and GE Proficy — as well as contextual data sources such as SQL Server, Oracle, and MySQL. Seeq’s support for time series data and its associated challenges relieves engineers of hours and days of futility spent finding insights to process manufacturing data with antiquated methods, such as spreadsheets. Seeq enables engineers to get more value from data already collected, and enables organizations to access and execute on those insights. Using Seeq, it was determined that the best indicator of a blockage event (Figure 1) was in “The Time Between Pump Runs (Time to Fill).” “Time to fill” is basically the time it takes for sewage to fill a wet well and alert the pump to start running, effectively clearing the well of waste. Figure 1: Blockages were detected and the utility notified 13 hours ahead of time. Using historical data, Nukon identified the fill and pump run behavior for two different profiles: on-peak and off-peak, and weekends and weekdays. “Normal fill” and pump behavior during these periods was identified for the sewage pumping station site. The Seeq model identifies blockages by detecting the absence of “normal fill and pump behavior” in real-time. For example, the absence of pump runs or extended fill time during peak times would signify an abnormality and possible blockage. Testing shows the Seeq model detects blockage 13 hours before spillage. The model can thus help field teams avoid spill incidents by providing real-time early warning of statistically significant partial or full blockages in the sewer network. The Seeq model operates in real time. It uses pump operating condition data from SCADA and field telemetry systems, enters it into the model, and performs calculations continuously. When it determines that conditions are present for a spill, it creates an event notification to provide an alarm of the impending issue. The solution is integrated with the utility’s OSIsoft PI System Notifications (Figure 2) for early alerting. Alerts are issued directly to the Operational Control Centre and include Seeq live links. This enables investigation by engineers and collaboration with field crews in real time to improve responsiveness. Figure 2: The Seeq software monitors pump data in real time. If it finds a problem, it tells the OSIsoft PI System software, which issues a notification. The on-peak/off-peak model was installed as the online sewer blockage detection system for every sewage pumping station in the Midway Point region. Each site’s specific behavior, deviations, and grace periods were accounted for to reduce false positives. The utility is pleased because each deployment is quick, low-cost, and does not require additional monitoring equipment at sites. The deployment helps to protect the environment by reducing the number of spills through early detection, and provides a number of other ancillary benefits. At present, the new system is constrained to the Midway Point sites to allow for model tuning over the next 12 months, and it will then be expanded to include additional high-criticality sewage pumping stations, such as those in environmentally sensitive areas. Andrew May is a Principal Consultant for manufacturing, infrastructure, and utilities at Nukon, with more than 13 years’ experience in systems engineering, MI/MES design, control system design, and commissioning within the utilities, process, mining, oil & gas, automotive, food & beverage, critical infrastructure, and manufacturing sectors. 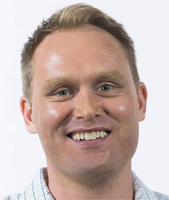 Andrew has worked within a diverse range of industry sectors and applications, enabling him to appreciate all aspects of control system engineering and pan-business optimization. He specializes in Business Optimization as part of the Nukon Senior Leadership team, helping businesses understand and implement their strategic vision using technology to deliver innovative projects for their customers.